It is a typical fall morning with a cool breeze pulling the last of the bright leaves off the trees. It is to be cold tonight for the trick or treaters. We never get to many trick or treaters. Many more nearby streets have more houses without the long walk. I picked up some candy yesterday and will be sending it to work with DH. The problem is he is off next week.....I hope there is some left when he goes back. This week the Sunday Morning quilt has binding and looks great. 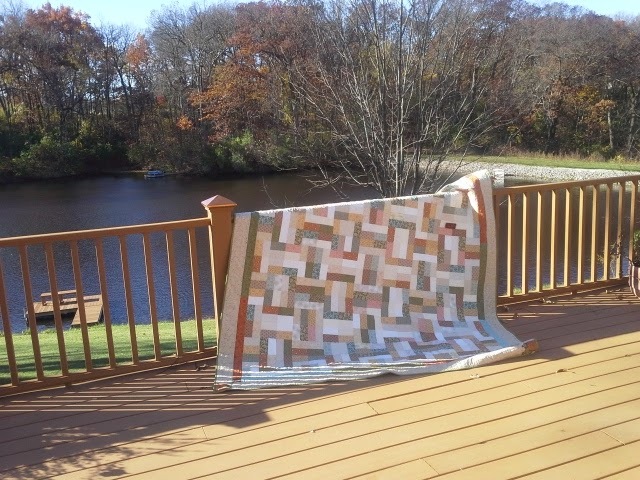 When I picked up the quilt to bring it back inside.....remembered the pinned dark orange piece......this was to remind me that I missed a small section of quilting. It will take only 1 minute. This quilt is based on the Avignon Picnic Quilt found on Moda Bake Shop. Stop over to Crazy Mom Quilts and look at other finishes. I am off to find the last 2 kits for the guilds raffle blocks. They are due Tuesday. The background fabric is misplaced........cleaned out the car today, removed a lot from the sew room yesterday. Where would you look next? It is not in 3 of my favorite bags!